Oklahoma, the youngest of our Territories, is in many respects also the most interesting. Many people confound Oklahoma Territory with the Indian Territory, but the two are separate and distinct, the former enjoying Territorial Government, while the latter, unfortunately, is in a very anomalous condition, so far as the making and enforcing of laws is concerned. Up to within a few years Oklahoma was a part of what was then the ” Indian Territory.” Now it has been separated from what may be described as its original parent and is entirely distinct. It contains nearly 40,000 square miles and has a population of about a quarter of a million, exclusive of about 18,000 Indians. It contains more than twice as many people to the square mile as many of the Western States and Territories and is in a condition of thriving prosperity, which is extraordinary when its extreme youth as a Territory is considered. 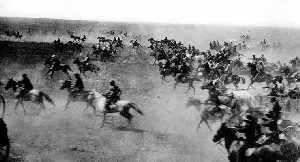 In 1888, Oklahoma was the largest single body of unimproved land capable of cultivation in the Southwest. It was nominally farmed by Indian tribes, but the natural productiveness of the soil, and the immense amount of land at their disposal, cultivated habits of indolence, and there was a grievous and even sinful waste of fertility. To the south was Texas, and on the north, Kansas, both rich, powerful and wealthy States. The Indian possessions lying between disturbed the natural growth and trend of empire. Seen from car windows only, the country appeared inviting to the eye. It was known, from reports of traders, to have all the elements of agricultural wealth. And this made the land-hungry man hungrier. The era of the “boomer” began; and the “boomer” did not stop until he had inserted an opening wedge, in the shape of the purchase and opening to settlement of a vast area right in the heart of the prairie wilderness. When the first opening took place it seemed as though the supply would be in excess of the demand. Not so. Every acre–good, bad, or indifferent–was gobbled up, and, like as from an army of Oliver Twists, the cry went up for more. Then the Iowa and Pottawatomie reservations were placed on the market. They lasted a day only, and the still unsatisfied crowd began another agitation. Resultant of this, a third bargain-counter sale took place. The big Cheyenne and Arapaho country was opened for settlement. Immigrants poured in, and now every quarter-section that is tillable there has its individual occupant and owner. But still on the south border of Kansas there camped a landless and homeless multitude. 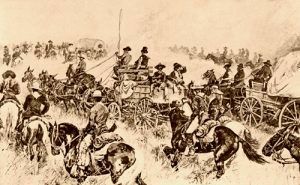 They looked longingly over the fertile prairies of the Cherokee Strip country, stirred the camp-fire embers emphatically, and sent another dispatch to Washington asking for a chance to get in. Congress heard at last, and in the fall of 1893, the congestion was relieved. The scenes attending the wild scramble from all sides of the Strip are a matter of history and do not require repetition. Five million acres were quickly taken by 30,000 farmers. The old proverb or adage, which states that the man who makes two blades of grass grow where one grew before is a public benefactor, would seem to proclaim that Oklahoma is peopled with philanthropists, for the sturdy pioneers who braved hardship and ridicule in order to obtain a foothold in this promised land, have, in five or six years, completely changed the appearance of the country. A larger proportion of ground in this youthful Territory shows that it is a sturdy infant, and it is doubtful whether in any part of the United States there has been more economy in land, or a more rapid use made of opportunities so bountifully provided by nature. Truth is often much stranger than fiction, and the story of the invasion of Oklahoma reads like one long romance. Many men lost their lives in the attempt, some few dying by violence, and many others succumbing to disease brought about by hardship. Many of the men who started the agitation to have Oklahoma opened for settlement by white citizens are still alive, and some of them have had their heart’s desire fulfilled, and now occupy little homes they have built in some favorite nook and corner of their much loved, and at one time grievously coveted, country. Oklahoma came into the possession of the Seminole Indians by the ordinary process and remained their alleged home until about thirty years ago. In 1866, the country was ceded to the United States Government for a consideration, and in 1873, it was surveyed by Federal officers, and section lines established according to law. It was the natural presumption that this expense was incurred with a view to the immediate opening of the Territory for settlement. For various reasons, more or less valid, and more or less the result of influence and possible corruption, the actual opening of the country was deferred for more than twenty years after its cession to the United States Government, and in the meantime, it occupied a peculiar condition. Immense herds of cattle were pastured on it, and bad men and outlaws from various sections of the country awoke reminiscences of biblical stories about cities of refuge by squatting upon it, making a living by hunting and indifferent agriculture, and resting securely from molestation from officers of the law. To remedy this anomaly, and to secure homes for themselves and families in what was reported to be one of the most fertile tracts in the world, Captain Payne and a number of determined men organized themselves into colonies. There has always been a mania for new land, and many people are never happy unless they are keeping pace with the invasion of civilization into hitherto unknown and unopened countries. 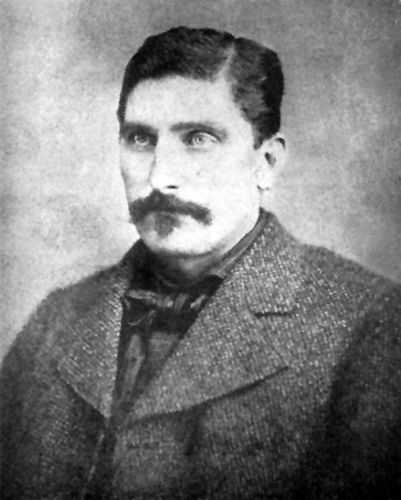 Many who joined the Payne movement were doubtless roving spirits of this character, but the majority of them were bona fide home-seekers, who believed as citizens of this country they had a right to quarter-sections in the promised land, and who were determined to enforce those rights. No matter, however, what were the motives of the “boomers,” as they were called from the first, it is certain that they went to work in a business-like manner, planned a regular invasion, and formed a number of colonies or small armies for the purpose. We will follow the fortune of one of these colonies in order to show what extraordinary difficulties they went through, and how much more there is in heaven and earth than is dreamt of in our humdrum philosophy. The town of Caldwell, on the southern line of Kansas, was the camp from which the first colonists started. It consisted of about forty men, and about 100 women and children. Each family provided itself with such equipment and conveniences as the scanty means at disposal made possible. A prairie schooner, or a wagon with a covering to protect the inmates from the weather and secure a certain amount of privacy for the women and children, was an indispensable item.